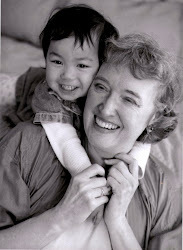 It was Mothers Day 2001, a warm, sunny day in China, when I adopted my daughter. Now, for both of us, it is a double day of celebration, when I became a mother and adopted my daughter. On this day, my daughter and I look at pictures of her adoption and laugh about our discoveries of eachother during those first days. We laugh about how she rapidly went from eating rice porridge to sampling most of the food on my dinner plate and loving every bite and how her whole body would wiggle with excitement when she sat in the stroller to go somewhere new, even the grocery store! At the moment , this is what she remembers as the beginnning of having a 'real' (her words) mother. As she grows up and maybe becomes a mother herself , her curiosity and love of life will probably propel her to want to discover something about her Chinese parents and family. ( research says that over 50% of adopted children seek out their Birth parents when they become adults) My daughter's beginnings, the circumstances of her birth and the reasons for being given up for adoption will probably always be mostly an unsolved mystery. I could say, and I do say, that it was due to poverty, cultural preferences, or the policies of the Chinese government, but this is only part of the story. As an adoptive parent, I try to make sense of what I do not know or understand, for the sake of my daughter. But it does not make sense to me. So as a mother to a mother I practice compassion. A mother, a mother in China, had a beautiful baby girl which she lost.